In pre-SQL Server 2012 versions you may encounter excessive transaction logging when you use the ALTER TABLE ALTER COLUMN command to change NULL to NOT NULL. Depending on the record size the amount of transaction log space used could be over three times the size of the table you are altering. This post shows that this is specifically an issue when changing variable length columns from NULL to NOT NULL. The issue does not occur for the same change applied to fixed length columns. Also note the log reserve figures. No reference to the table name here so this is just a metadata change. No references to LOP_MODIFY_ROW where AllocUnitName is dbo.testalternotnull so for fixed length columns this is a metadata only change. I won’t show the output for changing a CHAR(3) NOT NULL to NULL as the result is the same as that for VARCHAR(3) NOT NULL to NULL. That is, it is a metadata only change. So, yes, you can consider the BIT type to be a variable type and changing it from NULL to NOT NULL can result in high transaction log use. In summary, this post shows examples of high, and what you may consider excessive, transaction log use when changing variable length columns from NULL to NOT NULL. The StackExchange thread referred to at the start of this post shows that the resulting size of the transaction log may be many times the size of the table being altered. Fortunately, for SQL Server 2012 and above most column changes appear to be metadata only changes. 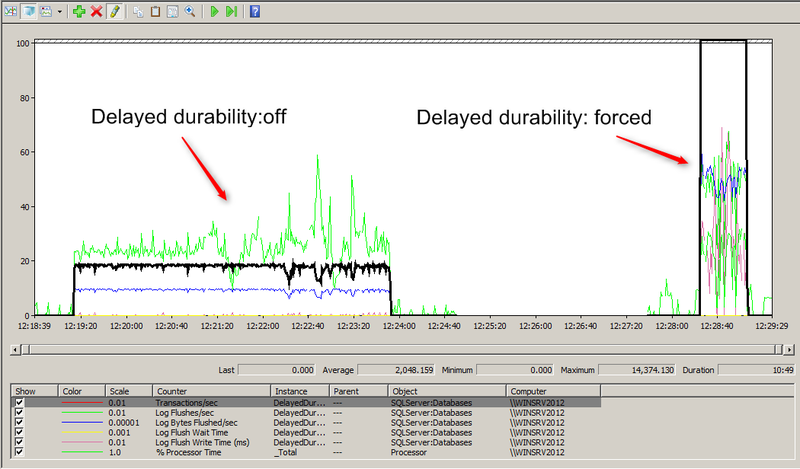 If some of your workloads are able to tolerate a certain amount of data loss and they are already bottlenecked on the write performance of the transaction log then SQL Server 2014’s delayed durability option will probably give you immediate performance boost. One use case that comes to mind is staging databases where ETL work is being performed. Some of the data feeds may be implemented as single row inserts as opposed to batch inserts. Within the application environment you may have no options available to convert to batch inserts (ie multiple inserts in one transaction). This post will show the performance improvements you could see by enabling delayed durability. The Sequence column started at 10000, it ends at 11732 so that’s 1733 write IOs matching the figure from the DMV. The Detail column shows the larger write sizes. Delayed durability is available in all editions of SQL Server 2014. For workloads that can tolerate a certain amount of data loss you’ll probably notice an improvement in your transaction processing rate. It’s commonly known that the sys.fn_dblog function can be used to query the contents of the transaction log. Frequently run data changes can be identified using this function. If you are taking transaction log backups then the record of the committed changes will be written to the transaction log backup and the log itself will be cleared. If you are running scheduled transaction log backups it’s possible to mine these backups using the sys.fn_dump_dblog function. An example of a statistic that may be useful is the number of page splits that are occurring for a given clustered index. You can see that the allocation unit name is not persisted in the transaction log backup so we have to use the allocation unit id to search for the specific clustered index. You don’t have to run this command on your production server. You can copy the transaction log backups to another SQL Server and query them there. This is just one example of mining transaction log backups for useful information. You are currently browsing the archives for the Transaction log category.